Crazy slowly am I going!! Bloglovin' is doing its best to drive me round the proverbial bend (which some would say doesn't take much). I have been having 'issues' with my feeder for over a week now and it's getting frustrating beyond the extreme. I posted a query about it on their site and my question, although it obviously went through, completely disappeared. Tonight I posted yet again and guess where it showed up? On facebook. Ummmm.....last I checked in my Funk & Wagnall's bloglovin and facebook weren't spelled the same. I haven't changed my settings and have NO clue why they aren't wanting to play nicely. - I can't mark any of the blogs as being read (once I've done so) - that's beyond annoying because I end up going back and rereading things I have already seen - several times over by now. - I can't sign out of the site - it keeps telling me to update my profile. I'd be more than happy to do so, but there's nowhere to update anything, even if I wanted to. Today's quote (very fittingly) is from Sam Goldwyn.... "This makes me so sore it gets my dandruff up"
Today I'm joining in with the other bloggers who are hopping around the world visiting blogs and getting to know one another. This Blog Hop is similar to a chain winding its way through the internet. Follow the links backwards to see who came before me and then forwards to the people that I tag for next week. The premise behind the hop is that you receive an invitation from someone that asks you to post your answers to four questions and you, in turn, ask three bloggers to do the same on the Monday of the following week. Visitors can then visit the blogger that invited you, as well as the three that you send them to. From there you can branch out and follow links,both backwards and forwards,to blogs throughout the world. It's a great way to 'meet' new people and find blogs that are interesting to you, as well as to increase readership to your own blog. Kind of like a chain letter but with none of the threats of the dire consequences that might befall you if you don't send the tea towel, recipe or whatever else they might be wanting. Nobody likes those! 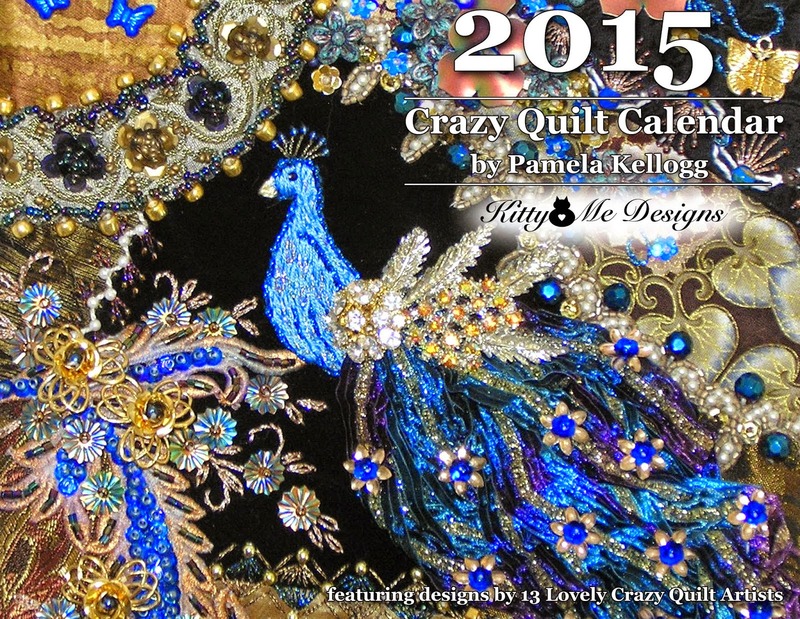 Many of you know that I am primarily a crazy quilter. It's something I am passionate about and spend pretty much all my waking hours doing. I usually have several different projects on the go at any given time. I never get bored that way! Currently I have three things on my work table. The first is the second white cloth that I'm creating with guidance from Karen Ruane's online classes. This is not done in the crazy quilt style, but I can't resist adding some elements of it. is the whole cloth, in the process of being put together. To the left you can see it folded, and below you can see it opened out. Each hussif is folded in thirds so there's lots of room inside for holding the things we like to stitch with. If I thought one hussif was good, so two must be even better...right? So how come I just pieced a THIRD one??? What woman in her right mind needs THREE hussifs? This one actually started with a stash-diving expedition looking for something else and discovering that I had a number of rose-themed pieces that I had been hoarding for far too long. The plan (and I DO have one) is to make another hussif and change the pattern to also include a purse that will not only hold the hussif inside, but also some larger tools and an in-process project. This is a question I seriously can't answer. Crazy quilters are a breed all unto their own and what differs between us is the access we have to supplies and embellishments. In my area there are no stores where I can go to purchase the things I like to use and I have to rely on thrift store expeditions and yard sales. Putting 'the word' out to my friends and family has yielded a lot of my stash, as well as inheriting bits from my grandmothers and my mother. My work combines common embroidery stitches which I like to augment with the use of waste canvas to add cross stitched patterns. Having a stash of things like beads, buttons and broken jewelry helps too. One of the purses I have made. Having a peek around at some of the other blogs on the tour shows that we all feel pretty much the same. 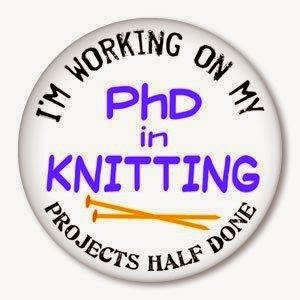 I need to create - I'm not happy unless I spend at least part of each day with needle and thread in hand. It's a compulsion and I'm driven to do what I do and simply can't imagine not being able to stitch. It's a passion, deep within, that refuses to go away. 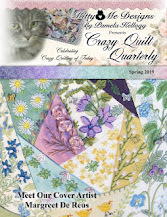 I like the recycling aspect of crazy quilting and the connection with generations past who made their quilts using whatever they had at hand. Crazy quilting is much the same because I use scraps of fabrics, many of them thrifted, and oddments of things that might otherwise be headed to the landfill. I like being able to keep memories of favourite pieces of clothing alive by using bits of them in my work and using things like a lonely earring that has lost its mate. Giving new life to things that would normally be discarded gives me great pleasure. I also love to work with recycled denim. 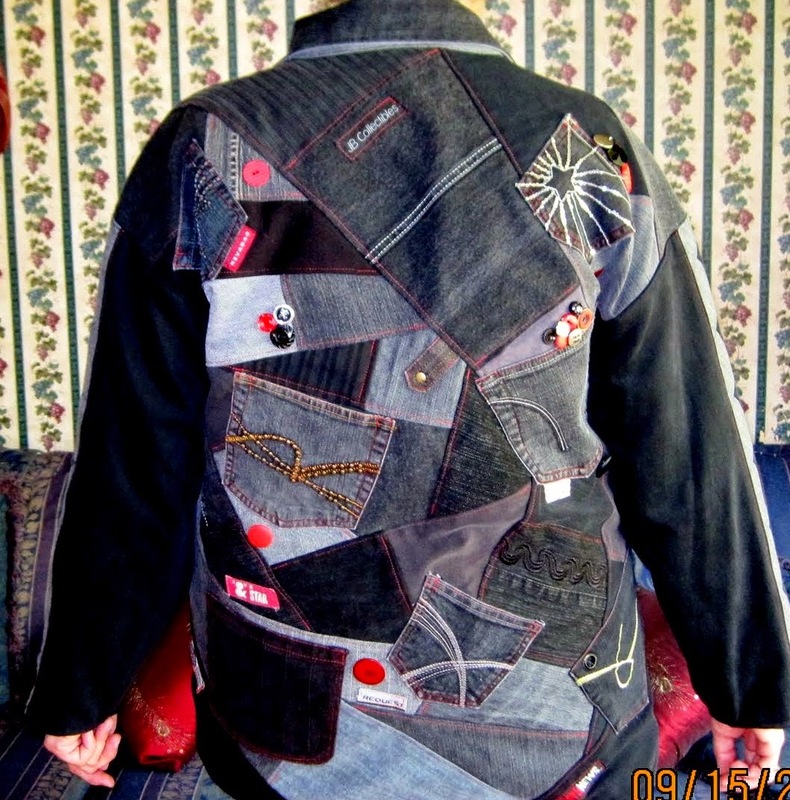 This is one of my crazy-quilt inspired jackets. My work tends to just evolve with no forethought on my part. I often pull some coordinating fabrics from my stash if I have a colour scheme in mind and work from those. The embroidery and embellishments I use are decided upon as I go along. Sometimes a piece of work will be inspired by something I find in my stash of embellishments (like the rose-themed piece shown above). Sometimes I will decide on a theme and what I use will be selected with that in mind. Once I piece the background the fun begins and I just play with ideas and elements until I come up with something that works. Another of my purses, with recycled denim this time. The remaining challenge of the Around the World Blog Hop is to introduce you to at least three bloggers. It was really difficult to find three people who hadn't already been tagged and who were willing to play along, so I'm going to do something a little bit different. I'm first going to send you to visit 'Boud' of Field and Fen (who has agreed to play along and will be doing her Hop post next Monday). She is an extremely well-rounded creator, both with her words and with the items she makes and shares with her readers. Her posts are quite often drool-worthy (quite literally!). Go visit and have a look around and you'll see what I mean! For another blog, I'm going to send you BACK a few stops on the tour and introduce you to Cyra of Free Form Stitching. 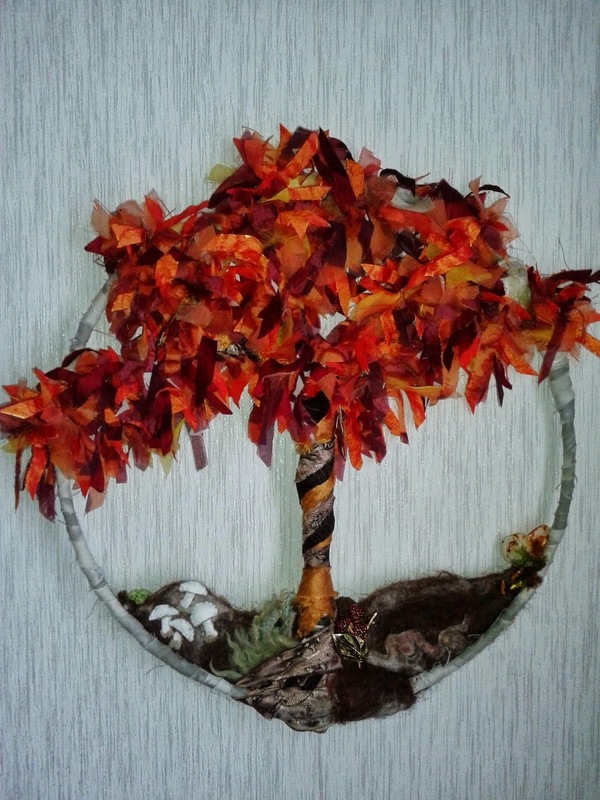 She creates beautiful work with an emphasis on free form crocheting and mixed media. I definitely admire her work! She also asked me to play along on the hop (thank you Cyra for thinking of me!). Finally, I will ask you to look to the right in my sidebar and have fun visiting some of my other favourite bloggers. Just click on each individual link and go and say hi. I know they'll be happy to welcome you! If you would like to visit lots more blogs on the tour (I have, and it's great fun!) just Google 'Around the World Blog Hop' and enjoy yourself. Thanks to Lyn for inviting me to play and thanks to you all for reading this far! I will leave you with a quote from Joseph Newton.... "We cannot tell what may happen to us in the strange medley of life. But we can decide what happens in us--how we take it, what we do with it--and that is what really counts in the end"
Just a quick question before I do my Around the World Blog Hop post....is anyone else having issues with your Bloglovin feed? For some reason I can't mark any of the posts as read nor can I sign out of the site. It keeps cycling me back wanting me to update my profile (which I've done). Am I the only one? It seems like the past week or so we've done nothing but run the roads for various reasons, which translates into precious little getting done in the way of things I'm able to show you. Hopefully one of those will tickle your funny bone, and I will leave you with a quote from William Arthur Ward.... "God gave you a gift of 86,400 seconds today. 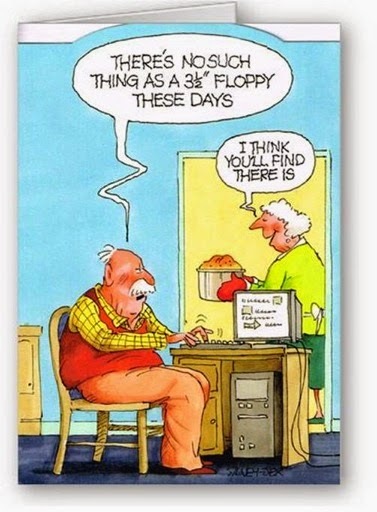 Have you used one to say 'thank you'?" Stay tuned for my Around the World Blog Hop post on Monday! Each of these jars holds approximately twenty plum tomatoes, believe it or not! They are SO sweet and full of tomato flavour and it's hard not to keep snacking on them til they're all gone. They'll be a tasty addition to salads over the winter (if they last that long!). Today's quote is from an unknown source.... "Things which matter most must never be at the mercy of things which matter least"
As if I need to start anything else (! ), yesterday I pieced together a new hussif. When I was going through my stash a little while ago I realized I had several things that had the theme of roses and set them aside to ponder what I might make to use them. I could, of course, have simply made a crazy quilted block but that didn't serve a useful purpose. The main colour theme (white) didn't lend itself to making a purse because that simply wouldn't be practical (at least for slobby me!!). My mind kept turning to a hussif with a matching purse that would serve to carry extra sewing goodies that wouldn't fit into the hussif itself. Perhaps the purse could be large enough to also carry an in-process project too. Hmmmm..... ponder, ponder. Well, all that pondering has led to me starting another hussif. This one will be different from the others I've done. I plan to make the inside more detailed with lots and lots of roses embroidered everywhere. This is the left side of my hussif (it's a three-fold 'book'). I had several rose-themed hankies in my stash so I was able to use them in this project. I have a collection of rose brooches and such that I plan to include, as well as embroider lots of roses. 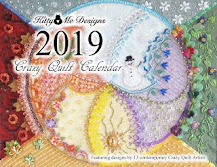 For those of you who are new to my blog, perhaps you might like to see my other two hussifs, so click on 'Crazy Quilting' in my sidebar and it will take you to my projects. A scroll through will yield pics of the hussifs. Some of you might find THIS article of interest. Mary Corbet discusses various forms of transferring patterns for embroidery and there is lots of good information that you might find helpful. Today, the quote is from Winnie the Pooh.... "What day is it?" asked Pooh. "It's today." squeaked Piglet. "My favourite day." said Pooh. I actually did do some stitching today, but haven't taken photos as yet, so I will share a picture of the delicious supper our #2 son made for us when he was home. And, before you ask, yes he made those buns - from scratch! EDITED TO ADD: For those of you who asked, there was tomato sauce, zucchini, cheese, and the eggs were poached in the liquid. There might have been other ingredients too, but I wasn't privvy to the cooking process!! Served over quinoa. Thought I'd also tell you about a very interesting article I found on Studio Kat's blog. She discusses doing more of what you love, which will lead to a happier life. I thought it was worth sharing with you, so go HERE to read it. Today the quote is from Tama Kieves.... "You can't cling to the old nest and soar to the flowering branches at the same time"
Sorry about being AWOL from my blog for a few days but we've been enjoyed a nice visit with our #2 son and daughter-in-love who live in BC. They decided to fly home for a wedding and we got to have them with us for three whole days! Needless to say the computer was the furthest thing from my mind! One of the things I wanted to make mention of to you is something I read about on Mary Corbet's blog a few days ago. I assume many of you are familiar with the beautiful 'Inspirations' magazine, but perhaps you were unaware that they are in danger of having to quit publishing. It would be a huge blow to the world of embroidery if that were to happen. They have put a plea out there for people to please consider subscribing so that demise won't happen. They have come up with a novel way that makes it much more affordable for those of us that would love a subscription but can't pay for it all at once. It's a 'pay-as-you-go' plan, whereby you pay for each issue as it's published and you can stop at any time you like. Go to Mary's post HERE to read more about it. I have done the 'pay-as-you-go' and can't wait for my first issue to arrive!! Thought you might like to see my current 'collection' of tarnished silver pieces. The piece on the left has a lovely lid so it's perfect to hold my sewing pins. The rest are holding assorted pencils, scissors and such. Would love to stumble across a large coffee pot that could be turned into a lamp. I'm sure I'll find one someday! Today the quote is from Martin Luther King.... "If a man hasn't discovered something that he would die for, he isn't fit to live"
Well, actually I've been back since Wednesday night, but had a ton of catching up to do so haven't had much time to be on the computer.We had a lovely time - very laid back. 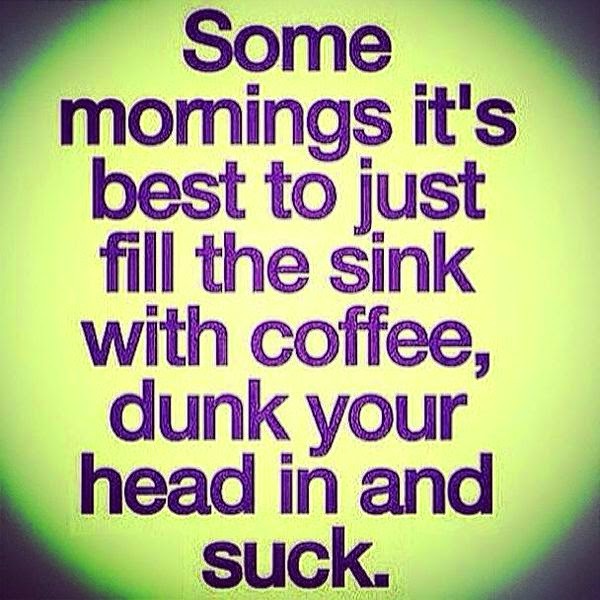 So nice to not have to rush anywhere or do anything on any sort of schedule. The weather was perfect which was a nice bonus as well. We had Irish coffee on our balcony outside our room. We saw this view from the balcony. We hiked on a trail. We sat on this incredible beach. We ate breakfasts that looked like this. And, when we came home we made these. The quote for today is from Anne Morrow Lindbergh.... "If you let yourself be absorbed completely, if you surrender completely to the moments as they pass, you live more richly in those moments"
and a brand new grandbaby. Today the quote is from Oliver Wendell Holmes.... "Love is the master key which opens the gates of happiness"
The next three days will be spent on a honeymoon with my sweetheart. Be good while I'm gone! Within a few minutes of taking this picture, the sky was completely black. Definitely scary!! To go to the opposite extreme of the colour spectrum, here's the latest section I just completed for my second white cloth. I think there should be only one more left to do and then I can start to put it together. Today the quote is from anonymous.... "We are each of us angels with only one wing and we can only fly by embracing one another"
Tears - of joy and pride! I have a story to share today (being typed as tears drip down my face). Our sons grew up with a special friend who became one of the boys that we loved as well. Steven was in and out of our house all the time (as I know our boys were in and out of his). He could be counted on to know the weather report inside and out, and he was the conscience of our boys. Steven was, and is, incapable of telling a lie and if our boys happened to do something that was not quite up to our standards, we would be sure to hear about it. 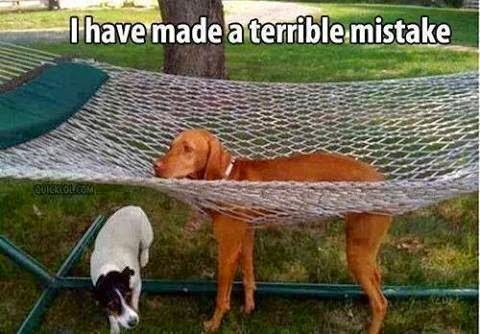 With that hanging over their heads, I'm sure our boys thought twice about doing many of the things that would have gotten them into deep trouble! Don't get me wrong - Steven was not a tattle tale - it was simply that his conscience would not allow him to participate in any wrong doing. To illustrate that point....our oldest son was somewhat of a dare-devil and would do things that he shouldn't and one evening he thought it would be 'fun' to try something that he'd seen at school. The premise was that you shook a can of pop and then inserted a straight pin into the side of it. Removing the pin would then (theoretically) result in shooting the pop with great force into your mouth. Well, as things are prone to doing, the pin shot out of the can with great force and then promptly disappeared. The boys turned the family room upside down hunting for the pin and Steven finally came to the conclusion that perhaps, just perhaps, said pin had gone down RJ's throat with the force of the pop. Despite huge protests from RJ, Steven did the right thing and got Mom and Dad. Suffice to say, a scary trip to the ER ensued and yes indeed, pin was lodged in RJ's stomach lining. Had it gotten loose it could have resulted in a perforated bowel or heaven only knows what. Despite all these goings on, Steven has remained a friend to all of us and, although he has moved away and we don't see him often he is still 'our' kid. I think, by now, (if you have read this far), you will have figured out that Steven is a special needs person. The 'pride' portion of this post comes from an article that is in the paper about Stephen being chosen as the Canadian Special Olympics male athlete of the year. He has won many gold medals competing for Canada in the Special Olympics with his main sport being speed skating. He also competes in the summer sports and does equally as well. If you would like to read more about him and about his competitions with Special Olympics, go HERE. As you can see, we are SO proud of him!! Today the quote is from Christopher Reeve... "I think a hero is an ordinary individual who finds the strength to persevere and endure in spite of overwhelming obstacles"
As I promised you yesterday, here are some closeups of the crazy quilted block I did for Pam Kellogg's calendar (which is available HERE). This is the lower left area. It's the first time I have tried to bead a 'cabachon' (in this case, an oval shisha mirror). It took me hours to do, but I like the effect I got. The lower right. The wee house in the woods is cross stitched using waste canvas. You can see the little crocheted snowflake that is beneath a sparkly button on the mid-left. Web stitches with beads added for extra sparkle. A seam treatment using silver sequins for additional sparkle. There's a seam covered in tatting, and also some pearls added. All meant to give the effect of snow. On the upper left - the trees are a button and there's more beads added to stitching motifs reminiscent (I hope anyway!) of snow flurries. Seam treatments done with the use of waste canvas. On the upper right - more seams done using waste canvas and more snow 'flurries'. I tried, with a limited degree of success, to make the pine branch dimensional. I think, if I were to do that again, I would use much thicker threads. In real life the 'snow' is quite sparkly - it's done with a nylon ribbon sold for Christmas decorating. More beads for sparkle here and there, and some snowflakes that were originally sold for scrapbooking purposes. If you click on any of the pictures, they should embiggen so you can see more of the details. Today's quote is from Thich Nhat Hanh.... "People usually consider walking on water or in thin air a miracle, but I think the real miracle is not to walk either on water or in thin air, but to walk on earth. Every day we are engaged in a miracle which we don't even recognize: a blue sky, white clouds, green leaves, the black curious eyes of a child, our own two eyes. 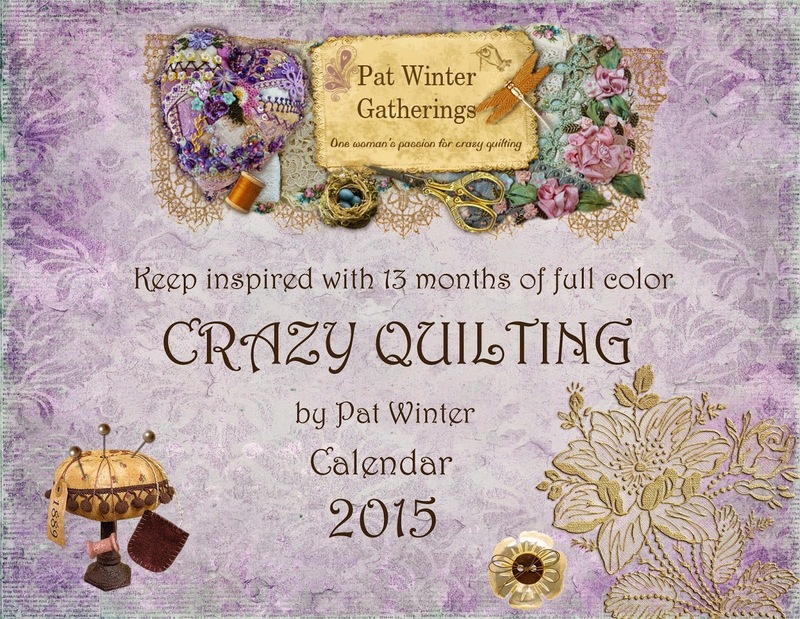 All is a miracle"
Just wanted to let you know that Pat Winter has also released her new crazy quilting calendar for 2015! It's so exciting to see that there is so much interest in the art form I enjoy so much and you can be sure that I have ordered this calendar as well! 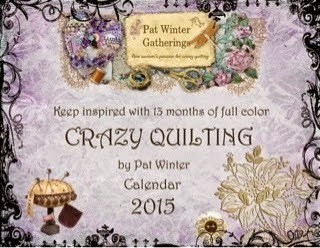 As you can see here, Pat has done two versions of her calendar. can see on the right. Decisions, decisions as to which one to order!! (I chose the one with the border). For more information, see Pat's posts on her blog HERE (for the plain version) and HERE for the one with the border. Stay tuned tomorrow for some closeup views of the block I created for the calendar that Pam Kellogg did. And, for the quote of the day, Helen Keller said.... "No pessimist ever discovered the secrets of the stars, or sailed to an uncharted land, or opened a new heaven to the human spirit"
The Great Secret Project of 2014? Revealed!! Remember how I was working on something that was a secret? That I couldn't post any pictures of? Surely you remember how curious you were to know what it was that I was doing? To say I'm excited is most likely the understatement of the year! My work is alongside some of the people I most admire in the field and I feel so very honoured to have been asked to take part in this project. This is what I created for the January page of the calendar. I think you can click on it if you would like to embiggen to see the details. To read more about it, and to discover who else has done incredible art for the calendar, please visit Pam's post on her blog HERE. And...to order your very own copy (they'd make great Christmas gifts, btw) go HERE. Thank you Pam for including me!! Today's quote is from John Mason.... "You were born an original. Don't die a copy"